We get a concealed weapons permit in the first place to give ourselves a tactical advantage over those who would try to harm us, or those we love. Part of the intention behind deciding to concealed carry is that nobody knows we are in possession of a deadly weapon. The element of surprise gives us that tactical advantage we are aiming for. Making use of that advantage comes down to timing. The timing of the presentation of that “surprise” can either escalate or contain a threat. What every person with a license to carry needs to understand is that getting a pistol out of its holster prematurely can be just as problematic—and dangerous—as failing to draw at the critical moment when it’s needed! Quite simply, a gun is a killing tool. Not an intimidation or a “wounding” tool. Its sole purpose and design is to take a life. As such, any display of a firearm in a situation that is anything less than life threatening can be looked at unfavorably, by bystanders and law enforcement alike. “First, police officers often enter potentially dangerous situations with gun in hand. They are usually, however, responding to a radio call that forewarned them of a hazardous situation. The private citizen, on the other hand, is usually reacting to an immediate threat stimulus from an attacker, quite a different situation. There are often environments where the arrival of police is imminent. In these cases having a gun visibly in hand puts the holder, even the “good guy”, in vastly more danger and tags them as a threat. When police arrive on the scene, anyone holding a gun stands a good chance of getting shot. This is one of the reasons why practicing the art of quickly and efficiently drawing our firearms is incredibly important. 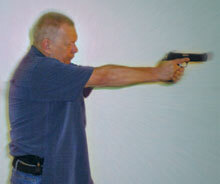 Knowing that we can have our gun in hand and aimed within 1 or 2 seconds can help us keep our calm. This prevents a premature draw that escalates the situation, or lands the permit holder in legal hot water. Re-holstering of our weapon is an equally important skill. There are never any guarantees that a situation is resolved. For all we know, that gun might be needed again in 5 minutes. If so, it must be readily accessible, not sloppily holstered or quickly tucked into our waistband. Confidence in one’s skills goes far in lending an air of calm and collectedness to situations that are otherwise teetering on the edge of lethal violence. This alone is reason enough to hone our pistol presentation and scene assessment skills to a razors edge.